Hey guys, what's up? This is Gir Todafunk, Mr. 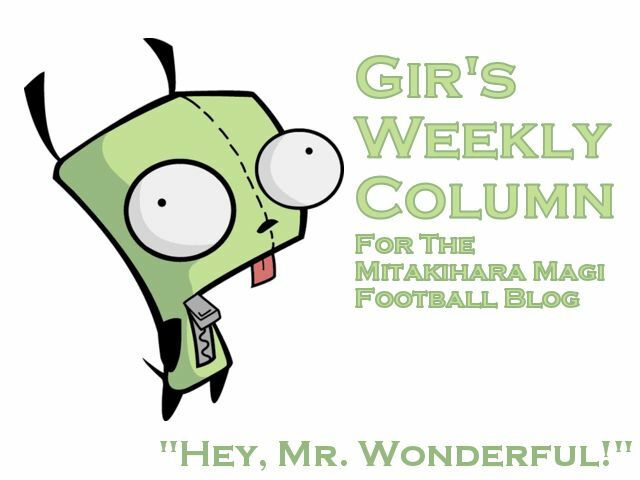 Wonderful, with another fresh weekly column for the Daily Magi and the Magi Football Blog. We are now two weeks away from the football season starting and I want to continue my ongoing dissertation of the cornerback position. In this column I talk about jamming the receiver and single/man-to-man defense. When a cornerback is attempting to jam or funnel a receiver, he is trying to disrupt the receiver's route at the line of scrimmage. When jamming the receiver a cornerback must keep his body squared with his feet shoulder width apart, so he can have power when jamming his arms out. When jamming his arms out it is important that the cornerback does not extend his arm too long, because a good receiver will escape from the corner's jam. By impeding the receiver's progress, the corner can provide his teammates with extra time to sack the quarterback (sometimes called a "coverage sack"), or force an ill-timed throw. In addition, a proper jamming allows the safety or linebacker to provide stronger run support because he then has more time to drop back into zone coverage in the event of a pass. In other words, he has been granted more time by the corner to recover from his mistakes if he anticipates a run when in fact the play is a pass. Single coverage in the "red zone" (an area between the goal-line and the twenty-yard line) is usually designed to prevent receivers from slanting towards the middle of the field. These types of routes are difficult to stop in the red zone because this area is usually congested with bodies colliding, crossing, and weaving in different directions. Although illegal, defenders are easily picked or screened (this is illegal yet hard to enforce in short field, congested situations) by opposing receivers and sometimes by their own teammates. To avoid this, it is often favorable for cornerbacks to either: "switch" assignments (where he will agree beforehand to trade assignments with one of his fellow defenders in the event that the receivers criss-cross as the play begins), or alternatively, a corner may instead line up close enough to the receiver (very close) at the line of scrimmage to force or jam him toward the sideline (outside) without violating the 5 yard no touch rule. Corners often refer to this second style of coverage as the "man under" technique. Next week, I wrap up my dissertation of the cornerback position with more tasty tidbits relating to single/man-to-man coverage. Till next time, I am Gir Todafunk, signing off. You are not alone.